Have your website up in minutes, simply follow these 3 easy steps: 1. Create an Account, 2. Choose a template, 3. And fill out your information! Have your website up in minutes in 3 easy steps: 1. Create an Account, 2. Choose a template, 3. And fill out your information! 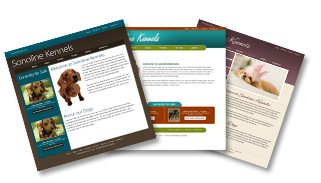 K9Wire.com gives the ability to dog breeders to create their own website. It is as easy as 1-2-3. We also partnered up with K9Stud.com to be able to retrieve their listings of puppies for sale and be included on your new website. It is very simple to generate a new website on K9Wire, simply create an account, update all your information and press submit. If you are only looking to post puppies and dogs for sale, click here to join our sister website.